To kickstart this year, we’re so pleased to offer you three outstanding wines this month from Kacaba Vineyards & Winery. The Pinot Gris was a best seller at our Outstanding in their Fields Taste & Buy event last month, and the two Syrahs are award-winning wines that showcase just how exceptional Kacaba is at producing cold-climate reds. Kacaba does Syrah particularly well! It was the first winery in Ontario and the second in Canada to plant syrah grapes, some 20 years ago, and its experience shines through in every bottle! It is also the only Ontario winery to have competed and won a medal in the table wine category at the Syrah de Mode Competition in Northern Rhone, the birthplace of syrah and where the only grape grown is syrah. The Syrah wines we are featuring this month are special in many ways – they are both from the same vintage produced from grapes grown on two different blocks of land on the Kacaba property, each with very different terroir. The Proprieters Block syrah is from the oldest vineyard on the property, and the Silver Bridge from the newest. Why not taste them side by side to challenge yourself to see if you can notice any differences…let us know which one is your favourite! Both wines were produced following techniques that support a philosophy of environmental sustainability, which is explained in more detail in this month’s e-zine. The e-zine features Vadim Chelekhov (in photo) – the 28-year-old assistant winemaker at Kacaba – who shares his passion for Kacaba, its philosophy, and its outstanding wines. Enjoy! 2015 Jennifer’s Pinot Gris – a beautiful, rich, and flavouful pinot gris named after one of the three daughters of owner Michael Kacaba. 2013 Proprietors Block Syrah – a delightful, well-balanced red wine that recently won a silver medal at the 2016 WineAlign National Awards of Canada. 2013 Silver Bridge Syrah – a scrumptious red wine with an aging potential up to 7 years, that was also a silver-medal award winner at the 2016 WineAlign National Awards of Canada. Every month, our Savvy Sommeliers seek out wines with you in mind. We take into consideration wines to enjoy with the seasonal cuisine, interesting wine experiences (like 2 syrahs from same vintage yet different terroirs) and interesting grape varieties…as starting examples. As you enjoy the wines in your Savvy Selections, at any time you find a new favorite wine and would like to stock up, call our Savvy Team any time at 613-SAVVYCO (728-8926) for additional bottles. Also call us even if you have a yearning for wines from other wineries we have featured in previous Savvy Selections. Cheers & wishing you the very best for a fantastic 2017! Vadim’s passion and appreciation for wine was sparked at an early age. He was born in Russia, in the republic of Kazakhstan, which was the last of the Soviet republics to declare independence. With independence, came the freedom to travel, and he accompanied his family on many trips to some of the oldest wine-making regions in the world: Germany, France, Italy, and Spain. Vadim arrived in Canada in 2002, completed high school in Hamilton, Ontario, and attended the University of Western Ontario, faculty of Health Sciences. Rather than pursue a doctorate, the path taken by many family members, his love of wine and winemaking beckoned. He joined the vineyard crew at Kacaba in 2011 and, in 2012, enrolled in the two-year Viticulture and Oenology program at Niagara College, while continuing to work at Kacaba as a cellar hand. In 2014, he was offered the assistant winemaker position and, since then, has worked alongside industry-respected winemaker, John Tummon (in photo on right). Kacaba is located on a slightly elevated 32-acre property on the Niagara Escarpment; 26 of those acres are dedicated to growing grapes. The unique microclimate of the Escarpment means that winters are relatively mild and arrive later than in other parts of Ontario; as a result, the red grapes can remain on the vines much longer, making it possible to produce much bolder red wines than are typically associated with colder climates. In 2016, the cabernet sauvignon grapes were harvested on November 21st; in 2014, on December 3rd. The same syrah clone is planted in three different Kacaba vineyards, each with a distinct terroir and each producing very different wines. In this month’s Savvy Selections, subscribers have the chance to taste and compare syrah grapes grown in two of the vineyards: the Silver Bridge vineyard (Kacaba’s oldest vineyard, planted in 1997); and the youngest vineyard – the Proprietor’s Block – planted in 2007, and which Vadim cites as being very promising. Kacaba also produces incredible, approachable white wines (including the pinot gris in this month’s Savvy Selections). The only white grape actually grown on its property, however, is viognier, which is used to add softness to its syrahs, making them more consistent with those from Northern Rhone. The growing of its other white grape varietals – including pinot gris, chardonnay, and riesling – are contracted to local craft wine growers. These partners grow the grapes in accordance with Kacaba’s stringent specifications, adhering to the philosopy of sustainability (e.g., no pesticides or herbicides). Kacaba then turns these grapes into beautiful white wine on the Kacaba site. If you are planning to go to this month’s Niagara Icewine Festival be sure to visit the Kacaba team and be treated to a sampling of the 2013 Cabernet Franc icewine which will be paired with Cajun-lime buttered jumbo prawns. That is an interesting pairing! This two weekend festival is also a great opportunity to taste many of Kacaba’s other great wines and to meet Vadim. The Festival runs over three weekends (January 13-15, 20-22, and 27-29). Be sure to tell Vadim, John and others at the winery that you are a Savvy Selections subscriber….they will probably roll out the red carpet for you! Savvy Sommelier Tastings Notes: This approachable Pinot Gris is an easy sipping wine, with fruit forward grapefruit, floral, lychee and tropical characteristics. The finish highlights notes of apple and citrus. Suggested Food Pairings: This white wine would pair extremely well with light seafood and shellfish dishes; creamy pastas; and cheese-based appetizers. A baked brie topped with a fig spread would be particularly lovely, as would be a hot artichoke or crab dip, or a cheese fondue (see recipe below). Cellaring: To be enjoyed now, with the opportunity to cellar for up to two years. Savvy Sommelier Tastings Notes: This award-winning Syrah is rich, soft, and velvety on the palate, exuding notes of black pepper, licorice, and raspberries. It is a wonderful example of a cool-climate Syrah, similar in structure and taste to its Northern Rhone cousins. Suggested Food Pairings: This lovely Syrah works well with many dishes, including lamb, Mediterranean dishes, and even Indian curries. Vadim likes to use it to marinate lamp chops – together with tomatoes, black pepper, onions, a bay leaf, and a sprinkle of cumin – for a day or two before cooking the chops over a medium hot BBQ. Cellaring: Drinking well now. Can cellar up to 5 years. See the silver bridge in the photo below?? Savvy Sommelier Tasting Notes: This medium-bodied Syrah boasts big flavours of black pepper, blueberries and blackberries. Smooth and rich-tasting on the palate, it is an easy sipping wine with lovely tannins on the finish. Suggested Food Pairings: This Syrah is able to stand up to big proteins, including steak, ribs, and even such game meat as duck, elk, and deer. Cellaring: Enjoy this now or save it for a special future occasion. It’s aging capacity is 6-7 years. Click here to see step-by-step instructions with photographs. Soak dried mushrooms in 1/2 cup (125 mL) hot water for 30 minutes. Meanwhile, trim fat from beef; cut meat into 1-1/2-inch (4 cm) cubes and set aside. In Dutch oven, sauté bacon over medium-high heat until crisp; transfer to paper towel-lined plate. Drain fat from pan. Add 1 Tbsp (15 mL) of the oil to pan; brown beef, in 3 batches and adding remaining oil as necessary. Transfer to bowl. Drain fat from pan. Add chopped onion, carrot, garlic, salt and pepper to pan; cook over medium heat until softened, about 3 minutes. Sprinkle with flour; cook, stirring, for 1 minute. Reserving soaking liquid, remove mushrooms and chop; add to pan along with soaking liquid, wine and broth. Bring to boil, scraping up any brown bits. Tie parsley, thyme and bay leaves together with string. Add to pan along with bacon, beef and any juices. Cover and braise in 325°F (160°C) oven until meat is fork-tender, 2-1/2 to 3 hours. Meanwhile, in pot of boiling water, boil pearl onions for 3 minutes; drain and chill in cold water. Peel and trim, leaving root ends intact. In skillet, melt butter over medium heat; brown pearl onions, about 5 minutes. With slotted spoon, transfer to bowl. Add mushrooms to skillet; fry until browned, about 5 minutes. With slotted spoon, remove beef to separate bowl. Add pearl onions, mushrooms and brandy to liquid in Dutch oven; bring to boil over medium-high heat. Reduce heat and simmer, uncovered, until thickened and onions are tender, about 25 minutes. Discard herbs. Return beef to pan and heat through. Sprinkle with parsley. Ingredient tip: Start with a boneless 7-pound leg of lamb. When all fat and sinew are trimmed, it will weigh about 6 pounds. When I last wrote about Pondview Estate Winery, it was 2011 and Lou Puglisi and his family had just opened a tasting room to showcase their first vintage as winemakers. The family had been growing and selling grapes for 30 years; in fact, in 2008 Lou had been crowned Grape King, a highly acclaimed industry award provided by Ministry of Agriculture to recognize the finest grape growers in Ontario. As a prize, Lou was offered an all expense paid trip to the Okanagan British Columbia, where he visited a number of small, family-owned wineries. This trip sealed the deal – it convinced him that the time had come to take the next step, and to begin making wine. Given the high demand for their wines, we’re especially delighted to feature three of Pondview’s small lot and premium portfolio Bella Terra wines. You can order extra bottles through us or stop in for a warm welcome at Pondview on your next visit to the Niagara area! You’re bound to find Joseph, Lou, or his wife Adriana behind the tasting bar. I’ve visited Pondview several times since we first featured them in 2011. And Lou, Marcel & Joseph are often at our Savvy Taste & Buy Events so we have quick chats while sampling their latest wine. When the opportunity for me to be the lead for this issue of the Savvy eZine came up, I jumped at the chance as it gave me a way to spend time with Lou and Joseph, and get into more depth about what has been happening at their winery over the past 5 years. Lou (in photo) is as busy now as he was then, but in a different way. “For our first vintage, 2009, the wine was selling out, and we were on top of the world! We figured, we’ll go to 5,000 cases and sell the remaining grapes to our partners, as we’d done before. But then, the winery took on a life of its own.” While I am interviewing him, he is dealing with the harvest and getting ready for another trip to China, where he will be educating his import partners and promoting Pondview icewine in Shanghai and Beijing. He also talks about his satisfaction with Pondview’s entry into a few select European market – Denmark, the Netherlands, Austria and England. And he’s building the business in these foreign markets with the same patient approach used to begin producing wine in Niagara – one customer at a time, one pallet of wine at a time, slowly building awareness and credibility. And this can be done now because of the family’s ongoing investment in Pondview. “You can’t sell what you don’t have”. Over the last five years, a 10-acre plot adjacent to the existing winery estate has been purchased. It was planted 2 years ago with Viognier, Malbec and more Pinot Gris vines. More recently, 12 acres at the juncture of the Four Mile Creek and St. David’s appellations have been purchased specifically for icewine with Vidal and Cabernet Franc vines. The core team remains in place – Lou, Fred (winemaker), Joseph and Adriana, along with a variety of well-qualified professionals have been brought in to support the growth in the business, including Marcel Morgenstern as head of sales, whom Lou has known since he was selling grapes to Pillitteri Estates Winery years ago. The Pondview name reflects the estate – there is a small pond onsite, but it isn’t large enough for ongoing irrigation of the vineyard. Fortunately, the family had purchased water rights to a creek that runs along the edge of the property, and water is regularly released into it – so irrigation during this past summer’s drought kept the vines alive and growing. But the desiccation of the soil was so profound, the vines struggled with nutrient uptake. Lou had to initiate new practices, such as using non-toxic foliar sprays of nutrients to help maintain vine health. The unique white wine is from a small lot (only 300 cases), produced from estate-grown fruit, barrel fermented and aged nine months in seasoned French and Hungarian oak. None of this wine was produced in 2014 or 2015 due to the effect of the very difficult winters of 2014 and 2015 on the vines. So you’re getting a ‘limited edition’ here! Savvy Sommelier Tasting Notes: There’s real complexity here – the aromas and flavours are a basket of lush Ontario orchard and pit fruits entwined with notes of fruit custard, sweet citrus and spiced caramel. Elegant and well balanced, the wine has a vibrant yet creamy texture and lingering spicy notes through the smooth lasting finish. Suggested Food Pairing: This has the weight and depth to pair with holiday turkey, with smoked salmon canapes, or with a creamy artichoke risotto. The hot 2012 vintage, considered a good one for Bordeaux varieties, provided good sugar levels and flavour intensity, while vineyard management ensured sufficient acidity was maintained. Unfiltered, aged eighteen months in French oak, this wine shows Lou’s dedication to the fruit and the vineyard, cropped at very low yields to ensure concentrated flavours. Savvy Sommelier Tasting Notes: Rich, ripe and fragrant on the nose, this warm, full bodied wine is bursting with aromas of spiced rose, succulent black fruit, licorice and earth. It’s refined, clean structure is a great counterpoint to the concentrated fruit flavours and it finishes with a lingering note of chocolate-coated coffee bean. Suggested Food Pairing: Winter warming meals of prime rib or tortière would be a great match. Cellaring: Drink now or cellar a further 3-5 years. The 2013 vintage was a challenging one, with a late spring, heavy summer rain combined with intense heat. Lou’s vigilance in the vineyard and strategy to use the long, warm fall weather to allow further ripening and concentration in the fruit ensured a wine of quality and great flavour. With a November harvest, the fruit for this opulent wine really benefited from that extended hang time, while in the cellar it was aged eighteen months in French oak and left unfiltered. Savvy Sommelier Tasting Notes: There’s great intensity to the aromas of cassis, mingling with underlying notes of compost and tobacco, delicate dried herbs and spice. The purity of the cassis flavours combines with blueberry garnished with a dash of dark chocolate and hints of vanilla. This full bodied wine offers a round rich supple texture, a spicy, warm palate and a sumptuous long-lasting finish. Suggested Food Pairing: Serve with braised short ribs or beef tenderloin. Cellaring: This wine may be enjoyed now or aged a further 2-4 years. In a medium saucepan, heat oil on medium-high heat and sauté shallots & vegetables until shallots are translucent but not browned. Stir in garlic, then rice to coat with oil. Reduce heat to medium and add wine, half the chicken stock. Stir constantly until liquid is absorbed, then add remaining stock and continue to cook, stirring, until liquid is absorbed a second time. Add cream, artichokes, and cook 5 minutes longer. Rice should be al dente; if it’s too hard, add just a little hot liquid & cook until it is. Remove from heat, whip in butter & grated cheese; season to taste & serve. Whisk together marinade ingredients, then marinate peppers for about 15 minutes. Add mushrooms, tossing with peppers & continue marinating for a further 15 minutes. Remove vegetables from marinade (reserve marinade), cook in batches on heated grill, 8-10 minutes for peppers (or until lightly charred), 7-8 minutes for mushrooms. Brush with marinade during cooking. Remove veggies from grill. Place mushrooms upside down on flat surface. Layer with a piece of red pepper, a slice of cheese, zucchini, yellow pepper, a slice of cheese and another slice of zucchini. Poke the rosemary sprig through the middle of each stack with leaves at the top. 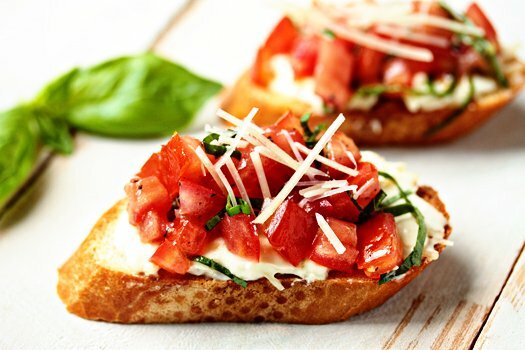 Place veggie stacks on a heat-proof dish and return to grill (turned off) so that cheese can soften, then serve with fresh French bread. Combine mustard, oil, soy sauce, garlic, parsley, pepper & rosemary. Brush over roast, including bones. Let sit for 2 hours, or refrigerate overnight. Preheat oven to 450F. Turn on oven broiler. Place roast fat side up on a rack in a roasting pan & broil for about 4 minutes or until fat is crispy. Turn off broiler, reheat oven to 450F & roast for 30 minutes. Reduce heat to 350F & roast for about 1 ½ hours longer for rare. Remove roast to a carving board & let rest 15 minutes to allow juices to retract while you make gravy. Remove roast from bones & carve into thin slices. Serve with gravy, roast potatoes & green beans.